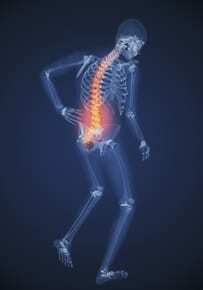 What Is Instability Of The Spine? Spinal instability, or disc disruption, is a disorder in which there is abnormal motion between the vertebrae. This can be caused by a congenital condition or may be the result of a traumatic injury. It can also be caused by spinal degeneration due to arthritis or osteoporosis, previous surgery, or the presence of a tumor. When a disc degenerates and possibly extends beyond the parameters of the spinal column, vertebrae move in an abnormal way, shifting the vertebral (facet) joints out of proper alignment. Too much irregular movement of the facet joints encourages the growth of bone spurs in the joints as well as arthritis which may further exacerbate the problem. In order to diagnose spinal instability, after a full physical and neurological examination, imaging tests, such as X-rays, MRI and CT scans are administered. Instability can be difficult to detect unless the body is in motion, however, and most diagnostic scans are administered to patients who are immobile. For this reason, motion-oriented assessments, such as X-rays taken of the patient in various positions, may be required. 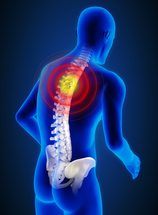 What Are My Treatment Options For Spinal Instability? Initial treatment for spinal instability is often bed rest along with use of a brace for stabilization during movement. Patients are typically advised to lose weight and maintain a program of regular exercise once the pain has been alleviated. In more severe cases, a combination of anti-inflammatory medication and physical therapy to build up supporting muscles may also be helpful. At times, stronger pain medications in the form of joint blocks or epidurals may be used to manage pain. If non-surgical options do not improve the symptoms, spinal instability is commonly treated with a spinal fusion surgery focused on the particular area of the spine with the problem. During spinal fusion surgery, which is performed under general anesthesia, two or more vertebrae are connected. 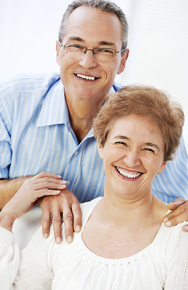 This is accomplished with the use of a bone graft from another part of the patient's body or from a bone bank. The donor bone is placed between the vertebrae and held in place with plates, screws and rods as the bone tissue merges. Eventually, as the vertebrae fuse together, the spine becomes increasingly stable and the patient's pain diminishes. After surgery, patients typically remain in the hospital for several days and are usually required to wear a back brace or cervical collar, depending of the location of the fusion, to help support the spine. The supportive device, although it will limit the patient's range of motion temporarily, will promote healing and improve the chances of successful fusion. During recovery, physical rehabilitation is necessary to re-establish strength and mobility. Complete recovery generally takes from 3 to 6 months. "I wouldn't be walking today without him. Dr. Girardi has the most gentle bed side manor , takes his time to answer any question you have big or small and most of all LISTENS! I can't thank him enough." To learn more about the services we provide, please call us today at 212-606-1559 to schedule an consultation.